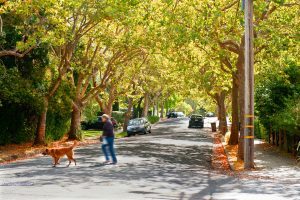 Did you know that San Rafael is a Tree City USA community? We have been celebrating our commitment to being a Tree City for 36 years! What are some of the benefits of trees? Extensive research has been done over the last ten years on the multiple economic, environmental, and social benefits that trees provide. Some of these benefits can be quantified, even monetarily, such as stormwater reduction, air quality promotion, and carbon sequestration that helps reduce greenhouse gases. Trees also provide less tangible benefits, such as natural beauty, a sense of place and identity, increased social interaction, and reduced crime. Healthy cities have healthy tree canopies. Trees make cities more livable, improve business, and encourage people to walk and get outside. They provide “green infrastructure” that grows and increases in value over time. The “grey infrastructure” of streets, sidewalks, and sewers deteriorate and lose value over time. The evaporation from a single large tree can produce the cooling effect of ten, room-size air conditioners operating 20 hours a day (National Arbor Day Foundation, 2004). This translates into lower energy bills. Homes on lots with many trees have 6-12 percent higher appraised values (National Arbor Day Foundation, 2004). A well-treed business district attracts shoppers who will stay longer, spend more for parking, and spend up to 12 percent more for goods and services (Wolf, K.L., 1999). Shaded streets last longer, requiring resurfacing less often. Asphalt shaded by urban trees has been shown to last 40 to 60 percent longer than unshaded asphalt (Burden, D., 2006). Stormwater reduction. Trees reduce runoff and erosion from stormwater by about 7 percent (Miller, Albin L., et. al. 1995). Trees intercept rain, absorb it through their root systems, and release it back to the air through transpiration. Reducing runoff means less pollution and less need to add more stormwater pipes. Air quality. One tree over 50 years generates $31,250 in oxygen, recycles $37,500 of water, removes $62,000 of air pollution, and controls $31,250 worth of soil erosion (USDA Forest Service Pamphlet No. R1-92-100). Shade and cooling. Trees in Davis, California, parking lots reduced asphalt temperatures by as much as 36 degrees Fahrenheit (Scott, Klaus I.; McPherson, E.G., 1999). Carbon sequestration. Trees release oxygen and sequester carbon from the atmosphere, thereby reducing greenhouse gases. Trees provide habitat for birds, wildlife, and insects in the urban environment. Riparian trees along creeks also provide important sources of nutrients, shade, and wood for in-stream habitat. Safer neighborhoods. Buildings and neighborhoods with high levels of greenery have fewer crimes (Kuo, F. 2001). Trees can reduce the urban heat island effect. Temperatures can be 5-15 degrees cooler on a tree canopied street (Burden, D. 2006), making a pleasant walking environment in the summer and reducing the energy demand of buildings. Treed streets lead to slower driving speeds and less road rage (Burden, D. 2006). Trees provide visual, noise, heat, and wind buffers. Trees reduce noise pollution by absorbing sounds. There is a 7 decibel noise reduction per 100 feet of forest. A solid wall decreases sound by 15 decibels (Coder, Rim D. 1996). Trees have a calming effect. People who have access to trees and green spaces have reduced blood pressure and improved overall emotional and psychological health (Wolf, K., 2000). Trees relieve stress and improve concentration. Attention Deficit Hyperactivity Disorder in children is relieved after contact with nature (Ulrich, R. 1984). Trees help heal. Hospital patients who had a view of trees through their windows required less pain medication and left the hospital sooner than similar patients who lacked a view of nature (Ulrich, R. 1984).